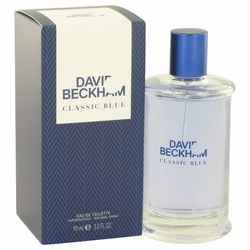 Blending traditional sensibilities with a cheeky nod to modern style, David Beckham Classic Blue is a fragrance for men who cherish their roots while they seek out new adventures. Created in 2013 by David Beckham, this fresh and elegant scent offers a subtle upgrade for your best daytime looks. Top notes of pineapple create a refreshing and welcoming feeling, while violet leaf and grapefruit notes establish a sense of masculine elegance. Base notes of clary sage and geranium close the scent smoothly.